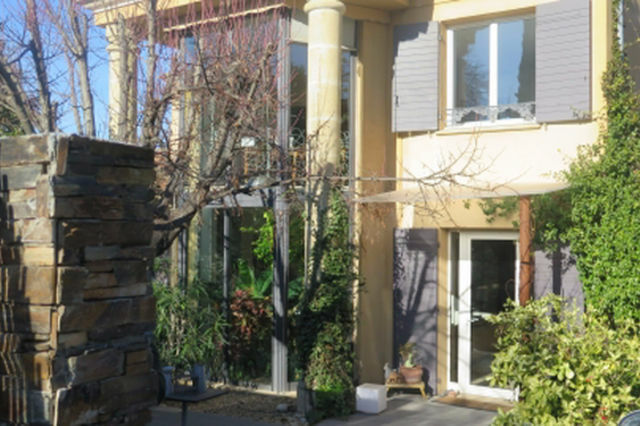 Aix-en-Provence, this town house of 360m2 located in a residential area has a garden of 900m2 without vis-a-vis. The main house of 290 m2 is composed as follows: On the ground floor, large living room, dining room, kitchen, laundry and toilet. On the mezzanine, a large bedroom with dressing room and bathroom. In the basement overlooking the garden, large party room of 60m2 and 32m2 cellar. Upstairs, there is a little extra room, bedroom with shower and toilet and two large bedrooms, one enjoying a bathroom with toilet and one enjoying a large bathroom bathroom with shower, dressing room and office area. And finally, two outbuildings attached: studio, T2, with a total area of 70 m2.